Welcome to KiteSoar.com - Here you will find a selection of the most unusual, colorful and unique kites and wind powered toys of all kinds. We have a huge variety of kites and accessories, including many that you may have never seen before. Anais Nin once said: "Throw your dreams into space like a kite, and you do not know what it will bring back, a new life, a new friend, a new love, a new country." We hope that these kites will inspire you to new heights and bring joy into your life! A KITE is a frame-work of wood or other material, shaped according to the fancy of the maker, a favorite form being that of an isosceles triangle, the base of which becomes the top, and is surmounted by a piece of cane or bamboo, bent in the shape of a semicircle. Over this frame-work is stretched paper, silk, or muslin; a tall of string, to which twisted strips of paper are fastened, acts as a steering apparatus; and a cord attached to the body or the kite, near the top, completes the mechanism and controls its movements. Long before hot air balloons and airplanes, mankind first reached out to the heavens holding the end of the string attached to a kite. Kiting is a fun activity that the whole family can participate in. Whether at the beach, at a park in the city, or at a competitive kiting festival, the pure and simple joy of flying a kite is unmatched. Just because it's cold outside doesn't mean you can't fly your kite. These aren't Ben Franklin's alternative energy kites! These nimble kites are the warriors of the kite world. Kites are also round, square, oval, diamond-shaped, oblong, etc. The origin of this toy is not traced, but it is known to have existed from remote antiquity. Etymology may possibly give a clue to the origin of its name, but it fails to signify the period of its invention. It is derived from the Welsh cûd and the Anglo-Saxon cyta, while the Gaelic kyta, meaning belly, may not improbably have been the root of the English word kite, from the signification of filling with wind which it indicates, as � the bellying sail.� But while the kite is thus accounted for in the northern tongues, the kite is found was in use even earlier in many Asian countries. In China, notably, it has been a favorite toy from time immemorial; the same fact exists with regard to Japan; and in these two countries the form of the kite was more diversified than elsewhere; owls, bats, dragons, and other creatures are usually copied, the material employed being silk or paper covered with painted designs in ornamentation. But besides its use as a toy, the kite has frequently been employed practically for important purposes. Kites has been used in engineering to carry lines to inaccessible points; and, in cases of shipwreck, has been made a medium of communication with the shore, and even to establish means of transportation, thus becoming an agency in saving life. The most famous scientific use of a kite was probably that of Benjamin Franklin, who used it to find a solution of the problem of the identity of electricity and lightning. With a design to establish the theory to this effect which he had formulated, Franklin constructed a kite. The frame-work consisted of a cross made of two light strips of cedar; over this was stretched a silk handkerchief, tied to the four extremities; a sharp-pointed wire extended a foot from the top of the upright stick of the cross, a silk ribbon was tied to the end of the string which held the kite, the end next the hand, and a key suspended at the junction of the twine and silk. The kite was raised by Franklin, assisted by his son, during a thunder-storm in June, 1752, and almost immediately he had the satisfaction of experiencing a spark on applying his knuckles to the key; and when the string had become wet by the passing shower, the electricity became abundant. A Leyden jar was charged at the key, and by the electric fire thus obtained spirits were inflamed, and all the customary experiments performed. This important testimony to the truth of Franklin�s deductions aroused the scientific minds of Europe to consideration of the question. He was highly honored by scientific bodies, and the royal society awarded him the Copley medal in 1753. The kite has added to the English language a species of phraseology peculiarly indicative of its own characteristics. 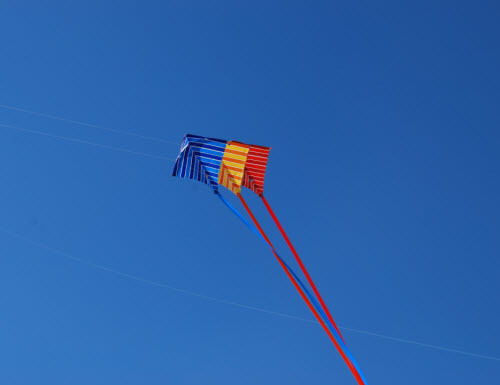 Such terms as �kiting,� �kite-flying,� and �higher than a kite� are all metaphors alluding to kites and kite flying. It is known that kites were first invented in Ancient China, around 400 B.C. Originally the kite had a primarily military purpose. It was used as a communication device (different colored kites could signal different messages) and to scare enemy soldiers and horses. Large kites were even used to carry observers aloft to spy on the movement of enemy troops. Eventually, however, the kite entered popular culture. Kite flying is extremely popular throughout Asia, and kite flying competitions are held regularly. In some places, kites are used in religious festivals. Kites did not reach Western Europe until the 12th century, almost 800 years after their invention in China. They were used mainly as toys and amusements, but beginning in the 18th century there was a renewed interest in the practical application of kites. Experimenters enhanced the flying capabilities of kites so that they could carry weights. This allowed them to be used in marine rescue operations (bringing ropes to ships in distress) or to carry materials over chasms during bridge constructions. Ben Franklin famously experimented with a kite in a thunderstorm to test the theory that clouds carried electrical charges. Amazingly he survived. Today, kites continue to be a wonderful way to reach out and touch the sky. New materials and design techniques have led to a profusion of different kite designs that are beautifully elaborate. In addition, scientists have continued to find practical uses for the kite: plans are in development to construct a system that will generate clean electricity using the incredible energy found in the winds of the upper atrmosphere. Ben Franklin would have been amazed at how far his kite has come! Here at KiteSoar you will find information about all kinds of kites as well as other types of wind toys.